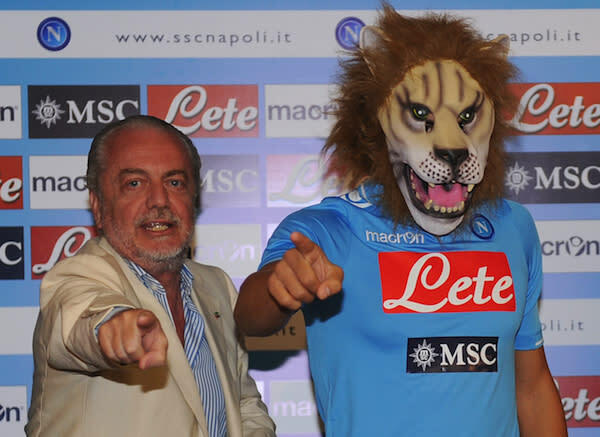 Any club owned by the producer of such cinematic classics as Men Men Men, Christmas in Beverly Hills and Yuppies 2 is going to have a flair for the spectacular, so it should be no surprise that Napoli had new signing Gokhan Inler wear a lion mask for his big unveiling to the press. OK, it's still a bit of a surprise. And that was the idea. Napoli's eccentric owner, Aurilio De Laurentiis apparently wanted to keep the press guessing as to who the player was even while he was standing right in front of them. And then he made Inler join him in pointing at the reporters so that truly wonderful picture at the top of this post could be taken. Apparently De Laurentiis got the idea from when Man City unveiled Carlos Tevez. He was impressed by the fact that Tevez not only wore his lion mask for the whole press conference, but his entire playing career with the club as well.